At this moment, I’m on a flight returning from a festival which I am quite lucky to have attended. This festival is named and themed around a concept dear to me. In fact, it’s one of the core things I hope BigSkyRise helps you feel on an ongoing basis. The concept is simple in nature, and once I learned to recognize it, it changed my experience of life enormously. It’s a big part of what brought me out of some very dark places in life, and I actively work to remind myself of it. 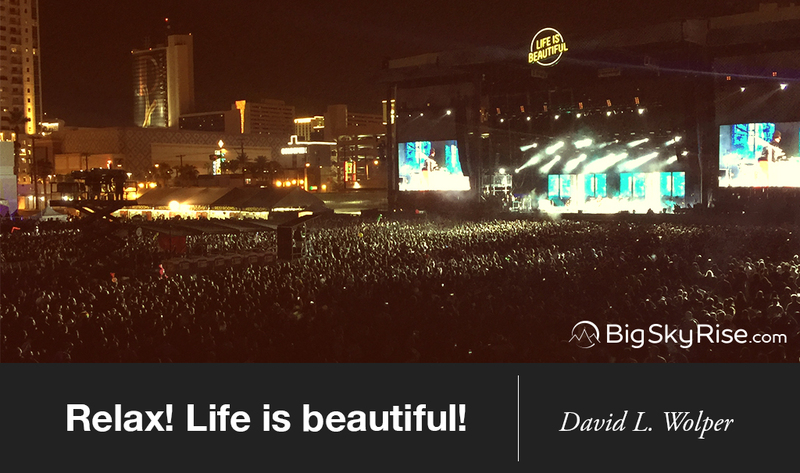 That concept — and the name of the festival — is Life is Beautiful. Often, it is easy to forget just how beautiful life is. We lose track of it. We have trouble seeing and believing it. We blind ourselves with thoughts, worrying that situations aren’t like we think we want them. We focus on the dark, the negative, and the painful. As a result, we get lost and don’t see what’s there. Life is beautiful. Life is precious and fragile. It is fleeting and ever-changing. Each moment is new, different, and one-of-a-kind. Each moment, and everything in it, is special and unique. Each moment swims in beauty. Enjoy each moment on your journey. Actively look for the beauty in the now. Look for all that there is to be grateful for. Within each moment an infinite spectrum of beauty surrounds, envelops, and lives within us. There are beauties of enormous scale, like is found in an incredible sunset, the aurora dancing with the stars of the Milky-way, and the totality of a solar eclipse. Life also offers us endless beauty through the small, delicate, and often everyday things. Take notice of those small things. The small things can make the biggest and longest lasting impacts. Mysteries abound, and we live within an ongoing miracle of existence. Simply being here, being conscious, being aware is incredible. It feels good to take a moment to remember, observe, and appreciate that. Give yourself the time and space, and actively consider the beauty flowing through this journey of life. Look for the beauty in life. Appreciate that life is beautiful. Sometimes it is hard to see the beauty in life. Keep actively looking for it, it’s there. It’s still there even if you aren’t seeing it; sometimes it just takes a different vantage point or tactic to shed the haze which covers our eyes. Thank you to Life is Beautiful for the excellent experience, for being themed around such an important concept to remember, and for inspiring me to write this on my journey home. Thank you for being you, for reading, and for sharing this journey with me.